Although we have a small amount of gear available for loan, most anglers prefer to bring their own. Please download our gear list PDF for information about clothing, tackle and equipment appropriate for this adventure. Contact us for a hard copy if you are unable to download the electronic version. Most anglers prefer to bring their own rods/reels, but we do have a limited supply of loaner and back-up fishing equipment (fly and spin). Please let us know ahead of time if you need to borrow a rod or reel for the week. Some of our day hikes require wearing waders, so non-anglers should bring comfortable chest or hip waders even if they do not plan on fishing. Check out our blog for some good info and discussion on your Alaska fishing trip gear and clothing. 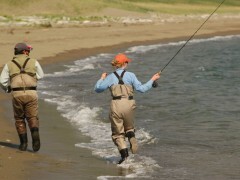 NOTE: The State of Alaska is banning felt-soled wading boots in 2012. If you need a satellite phone for personal use during your visit, please rent one prior to your arrival at camp from Outfitter Satellite. They may be reached at (877) 436-2255 or through their website. There is a satellite phone available at camp for emergency use only. We do see bears throughout the season, but please DO NOT bring personal firearms to camp.